The Y.A. 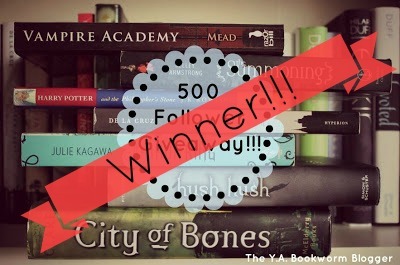 Bookworm Blogger: 500 Follower Giveaway Winner! Congratulations Marissa! I've already sent you an email letting you know you won, so be sure to respond to me as soon as you can! As for the rest of you, don't be too disappointed because they'll be more giveaways coming up soon! Thanks again for all your support!